a later starting Leafs game pushed back the start of an evening with Mollys Chamber at On Cue. ah, such is the life of a band playing sporting-related venues. we cut down the sets and for the 2nd show in a row, nailed our 2nd set. 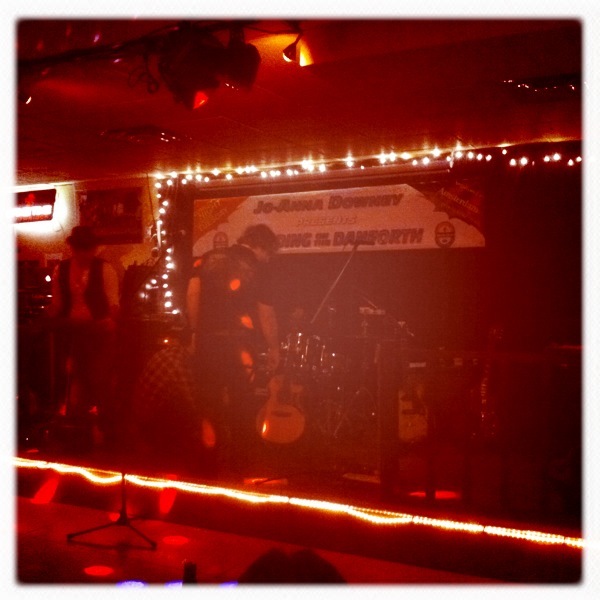 a great mix of rock, acoustic and dancier numbers that got some xtra spice with our funky hat. also adding to fun, earlier in the day we had bought a 12v adapter and finally got the full moxy out of our catalinbread sft. we had been browning it with the 9v and the change made a massive diff! more room to play and tweak. can’t wait to play more and tweak more in the month ahead. hands down, one of the best items we’ve obtained this past year. as far as our playing goes, we had 3 brain cramps over the course of the evening but other than that we were generally pleased with the gig. earlier in the week we’d passed over reviewing a couple of the songs thinking that we were good2go with them but alas yet another reminder to self to GO OVER EVERY SONG despite what u might think. we cannot say enough about the fine and tasty perogies at OnCue. always a highlight and highly recommended! what are u waiting for? grab your pool stick and feed bag! oh, that's what we play? ha! -retuning and having to make sure the bass stays retuned. -bringing another bass to jams and shows so we don’t have to do the first point as much. making sure that bass is tuned right. -the sound isn’t all that great to our ears. meaning, we understand why Drop D is popular and why some love it and how it sounds. but the sound it produces to our ears just isn’t pleasant to us. the drop sounds blurrs the line between the notes in our ears and it just either becomes a muddy mess in our head or just sounds completely off. we often waver between having to play so precisely it produces a world of headaches or we just start throwing enough notes at the wall hoping something sticks. -generally speaking, drop d songs are not our cup of tea. very, very few have a place on our playlists. so if we are playing a drop song, it usually means having to learn a song we don’t know at all. having said all this, our next night(this coming friday!) with Mollys Chamber includes at least 4 drop D songs. ah well, our string of avoiding playing Drop songs is about to come to an end. we’ll put our best foot fwd with the spirit of taking one for the team and hope someday some1 does the opposite for us. recent videos au go go! 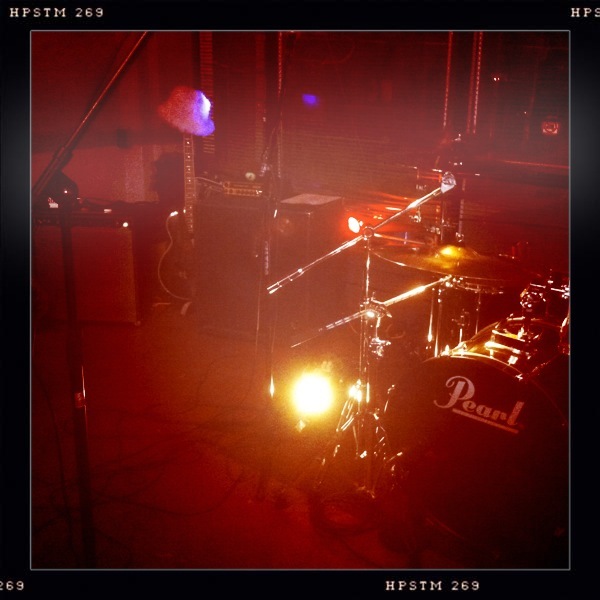 eton house stage. watch that railing! 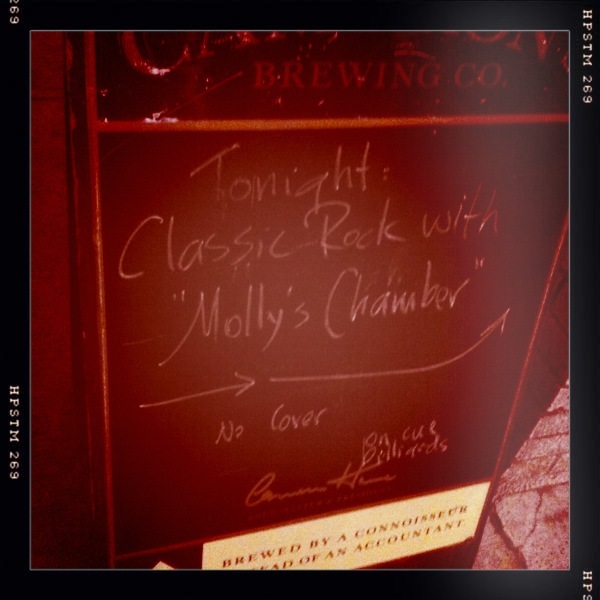 just a quick post to review last weekend’s gig with Molly’s Chamber at the Eton House. 3 sets of rockin good times! we had a soundperson but he didn’t do much other than run our mics thru the house PA which was a bit different than the norm. folks said the sound wasn’t horrible and u could hear everything but not up to snuff for a gig with a soundperson. despite not hearing much of the vocals and lead geetar while onstage(no monitors), we’d give ourselves a B for the overall performance. getting more comfortable with the material is a high priority and there is lots of room to improve. speaking of room, we were on a stage with a railing and we kept hitting our headstock on the pole at the end of the railing during the show. yet another reason to not gig with your best bass. poor EB3 took a beating but luckily no scars the next morning! thx 2 all who came out to witness and the props. 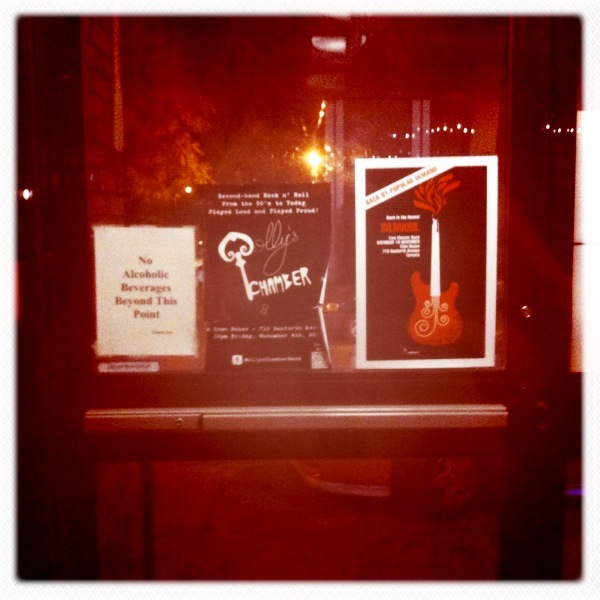 we sure had fun and totally dug the overall vibe of the joint! both the bands released some video evidence this week. check out Eton House viz from Mollys Chamber from the homepage. check out Orleans viz from Those Handsome Hooligans from the new youtube site. enjoy and will blog soon! finally a weekend off from gigs and a load of songs to learn from the likes of OLP, Velvet Revolver, Foo, Van Morrision, Hip, big wreck, coldplay, black keys, steve earle, doors & more! lots of jams til the end of the month. let the good times roll!